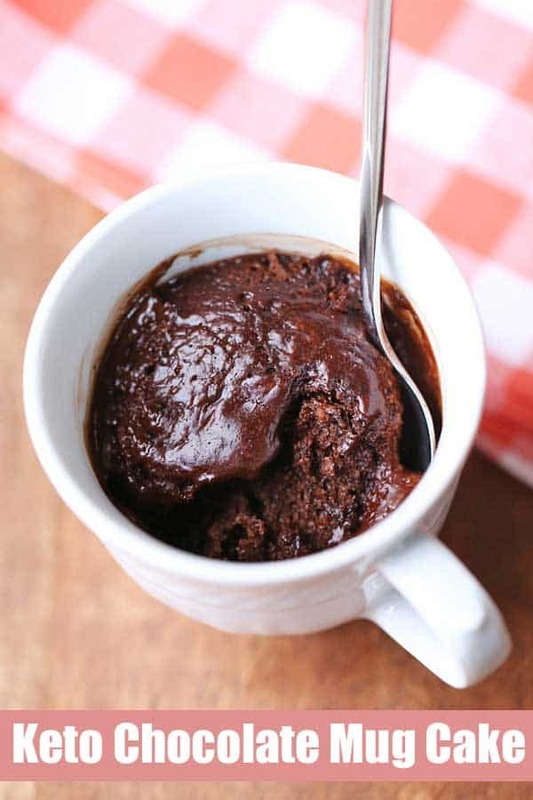 It’s the perfect chocolate mug cake – rich, chocolatey, gooey and ready in five minutes. It’s also keto and gluten-free! I’ve been working on making the perfect chocolate mug cake for six months now. I wanted it to be just right – rich, chocolaty, gooey, and I also wanted it to be low carb and gluten free. I tried maybe 20 recipes for chocolate mug cake, I kid you not. And besides gaining three pounds, I was sorely disappointed in all of them, mostly the texture. It was either very dry or too crumbly and not at all cake-like. Then it dawned on me. These wonderful paleo chocolate muffins, deeply chocolatey and moist and so so good. Why not try to create a keto version and microwave it? UPDATE: Yay! I figured out how to make a single serving of this amazing, moist chocolate mug cake. Scroll below to the recipe card for instructions. But even if you make two servings, the good news is that even two servings of this amazing chocolate mug cake are not so bad for you. After all, it’s made without wheat flour or white sugar. And it IS made with the goodness of almond butter, eggs and cocoa powder. Which nut butter to use in this chocolate mug cake? I usually make this chocolate mug cake with creamy almond butter. But I’ve tried creamy unsalted peanut butter and that worked too. If you use salted peanut butter, you should probably omit the salt. If you try different nut butters, you might need to adjust the liquids, depending on their thickness. I once made this chocolate mug cake with tahini (sesame butter) which was very thick. So I had to add a tablespoon of milk (or water) to the batter. You’ll know it’s too thick if it’s difficult to stir. The batter should be thick but smooth and velvety and easy to stir. Since this recipe relies on baking soda as a leavening agent, you should use natural cocoa powder, and not Dutch-processed cocoa powder. The Dutched cocoa powder is not acidic so it won’t react with the baking soda, and the chocolate mug cake will be flat rather than fluffy. Yes! You can use 2 tablespoons of a low carb granulated sweetener instead of the stevia. And if you’re unconcerned with carbs, you can sweeten this cake with 2 tablespoons maple syrup, omitting the stevia and the milk. How long to microwave the cake? As with all microwave cakes, you will need to experiment to find exactly how long to microwave the cake in your microwave and using your particular mug or ramekin. I use two 6 oz cappuccino cups. Try to stick with a similar size mug or ramekin. Using a much larger container could dry out the cake. As for how long to microwave this chocolate mug cake, I would start with 50 seconds for the two cakes, then check to see how they look. Your goal is to keep them soft and gooey, but not liquid. It’s definitely better to err on the side of microwaving too little than too long. You can always keep microwaving in 10-second increments, but you can’t un-microwave a dry cake! If you don’t mind eating the whole thing, you can also simply mix the batter directly in an oversized mug (14 to 16 oz). Microwave the cake for about 1 minute, then check to see if it’s done. One of the best things about this chocolate mug cake is that you can make it the night before, refrigerate, then quickly nuke in the morning. 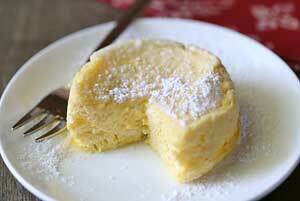 If you like cheesecake, you should definitely try this wonderfully creamy keto microwave cheesecake! 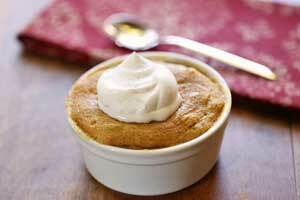 And this peanut butter mug cake is AMAZING. In a small bowl, whisk the almond butter and egg until smooth. Add the milk, vanilla, stevia and salt, whisking to incorporate. Gradually whisk in the cocoa powder, then add the baking soda. Using a spatula, scrape the batter into two small, 6-ounce cappuccino mugs, dividing it evenly. Each mug should be about half-full. The cakes will rise dramatically as they cook, so the cups need to accommodate that. You can also make one big cake by mixing the batter directly in an oversize mug (14 to 16 oz). If you’re making this the night before, cover each mug with plastic wrap and refrigerate until the next morning. Make sure to refrigerate immediately, so that the baking soda does not lose its potency. When ready to eat, place the two mugs in the microwave. Microwave them both together for 50 seconds. The batter will rise quite a bit while you microwave it. If you used one big mug for the entire batter, start with 60 seconds and go from there. Remove the mugs from the microwave and allow the cakes a few seconds to settle. They should not be liquid anymore, but they should appear very moist. Resist the temptation to microwave more (unless the batter is still liquid) – a chocolate cake is always better gooey than dry. Mix directly in an 8-oz mug or ramekin. Microwave on high until puffed and not liquid anymore but still very moist. Start with 30 seconds. Enjoy!